Time-trip back to the frightening era of 1957-1972, when monsters stomped into the American mainstream! Once Frankenstein and fiends infiltrated TV in 1957, an avalanche of monster magazines, toys, games, trading cards, and comic books crashed upon an unsuspecting public. 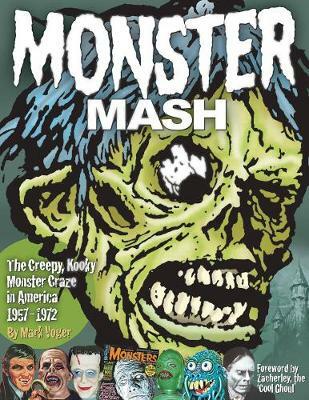 This profusely illustrated, full-color hardcover covers that creepy, kooky Monster Craze through features on Famous Monsters of Filmland magazine, the #1 hit "Monster Mash," Aurora's model kits, TV shows (Shock Theatre, The Addams Family, The Munsters, and Dark Shadows), Mars Attacks trading cards, Eerie Publications, Planet of the Apes, and more!It features interviews with James Warren (Creepy, Eerie, and Vampirella magazines), Forrest J Ackerman (Famous Monsters of Filmland), John Astin (The Addams Family), Al Lewis (The Munsters), Jonathan Frid (Dark Shadows), George Barris (monster car customizer), Ed "Big Daddy" Roth (Rat Fink), Bobby (Boris) Pickett ("Monster Mash" singer/songwriter) and others, with a Foreword by TV horror host Zacherley, the "Cool Ghoul."